You don’t need a lot of property to earn money from your homestead. Start earning a living on your homestead or farm today doing what you already love to do. With more than 50 ideas, there’s something for everyone who wants to start earning money from home. Guest contributor Tammy Trayer of Trayer Wilderness lives off-grid on her homestead in the woods. Today she’s sharing things that her family has done to earn money from their homestead. 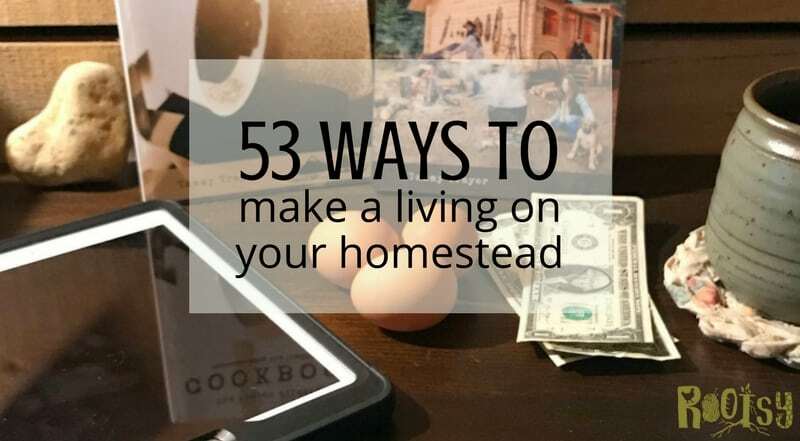 There are many things that you can explore as you start to making an income from your homestead or farm, but remember, you may need to progressively work your way into living your dream. That may require you to work away from home for a while as you get everything in order on your homestead. Making a plan and having goals will help you achieve your dream of making money from your homestead or farm faster than just willy nilly trying different things. I grew up in a home without a computer and never really got a lot of time on computers, but felt very driven to learn how to program while I was in high school. Directly out of high school I was hired by a programming firm where I was apprenticed for a year and continued working with them for 11 years prior to having my children. Then once I had children, through my knowledge, I was able to create my own web design business in an effort to enable me to be home. My profession is what allowed us to embrace our off-grid lifestyle because as long as I had an internet connection, I could work from anywhere. My husband Glen is a “Jack of all trades and a master of many”! He is my MacGyver – I always say he could make a pistol out of a paper clip. He has a very mechanical mind and is a very gifted man. This allowed us to be able to build our home ourselves and save a lot of money. Keep in mind it is not just the income you are bringing in, but the amount of money you can also save for yourself by doing many of the projects yourself. 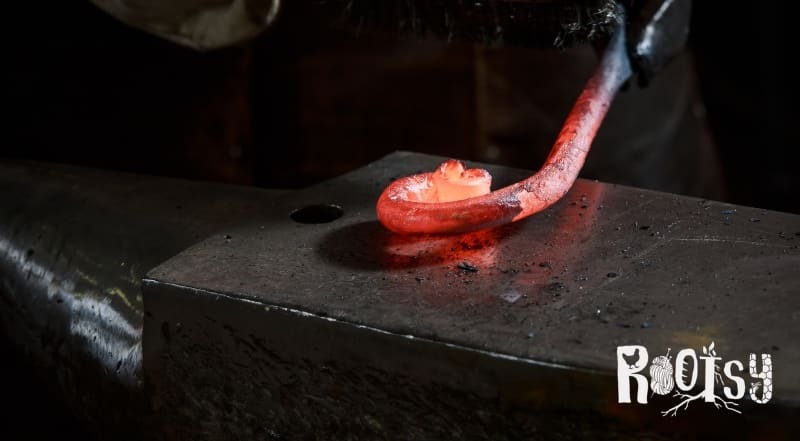 Glen is also a blacksmith and makes many of the things we need in his smithy, but he is also known to fabricate things such as our homestead plow and our sawmill, just to name a few. Consider ways that you can incorporate your hobbies and the things you do for pleasure. Once you have identified a market, these can be a great means of extra income from home. Contrary to many peoples beliefs, bartering is still alive and can be a great help in achieving goals on the homestead and saving money. When I say bartering, I am not just referring to good, but also services. 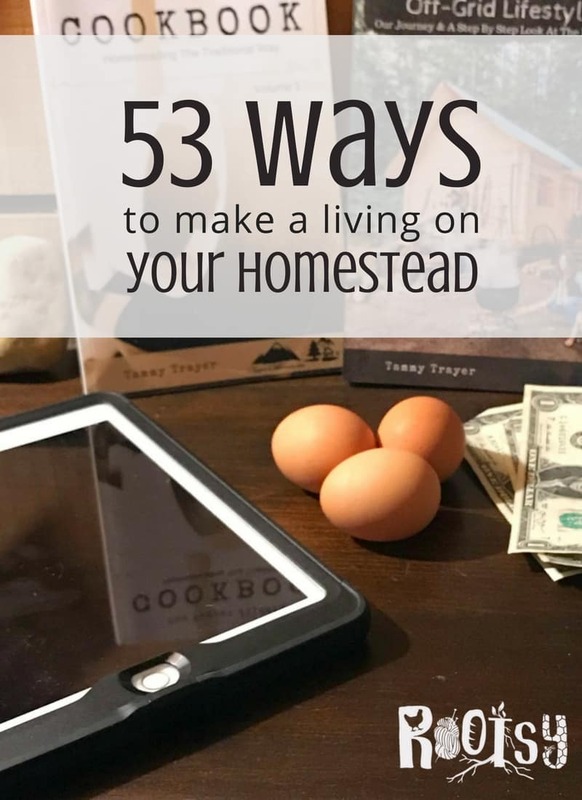 The bottom line is, to make a living from your homestead you need to not only create income but also limit outgo through doing things yourself and bartering for things you can’t do yourself. Below are twenty things we have done to earn money on our homestead. You will probably have different skills and ideas but use these as inspiration for your own money making ideas. Selling seeds – Saving seeds from your plants and packaging them in a pretty envelop with growing instructions on can earn you several hundred dollars, especially if the seeds are from unique or hard to find plants. 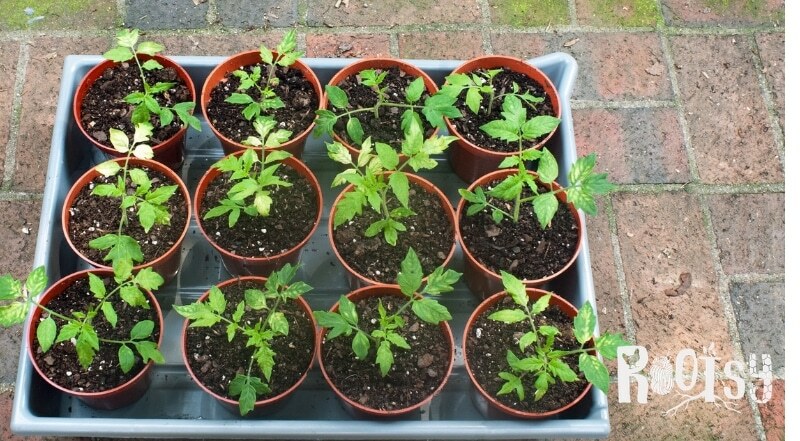 Selling transplants – Try as they might, some people just cannot start their own seeds and prefer to buy transplants for their garden. This is a great opportunity for you to use your seed starting skills and sell them to your friends and neighbors, and at farmer’s markets and craft shows. Foraged plants and mushrooms – For an experienced forager, this is a great way to make money from your homestead. You need to be absolutely sure you identify the plants correctly. People are often willing to pay more for exotic items such as mushrooms than they are common items, such as dandelions. Propagate and sell fruit trees – If you have fruit trees or vines that produce well, consider propagating them through cuttings or grafting and selling them. This takes more time than selling transplants but the payoff is much higher as many fruit trees sell for $35 to $100. Selling fruits and vegetables through a CSA or farmstand. Consider selling your extra produce through a CSA, farmstand, or the local farmer’s market. You don’t need a lot of acreage to grow fruits and vegetables for market, Compact Farms: 15 Proven Plans for Market Farms on 5 Acres or Less can help you make a plan. Selling dried herbs – Growing and selling herbs can be a huge money maker, especially if you can grow unique, exotic, or medicinal herbs. Instead of selling the plants, sell preserved herbs. You can do this by drying the herbs and packaging them in jars or ziplock bags. You can also use the herbs to make higher priced items such as custom teas, infused oils, or even tinctures. Sell fresh flowers at the local market or directly to retail establishments. – You don’t need a lot of space to grow flowers for cutting; this book is a great resource for flower farmers. Like vegetable gardening, the profit is in growing and selling unique, exotic, or hard to find flowers. Selling manure – Yes, people will buy your animals’ waste to compost down for their gardens. Raising meat for sale (depending on your location and the county limitations) – If you enjoy raising meat animals, this is a great way to add income to your homestead. People will pay a more for meat that has been humanely raised from someone they know rather than buying in the grocery store. The Backyard Homestead Guide to Raising Farm Animals: Choose the Best Breeds for Small-Space Farming is a great resource for those who want to raise meat animals on a small homestead. Raise fiber animals and sell the fur – Although sheep are what most people think of when they think of an animal raised for its fiber, there are other fiber animals that can be raised on a homestead. Angora rabbits can be raised on a very small homestead, while angora goats will need more space. Alpacas are also raised for their hair. 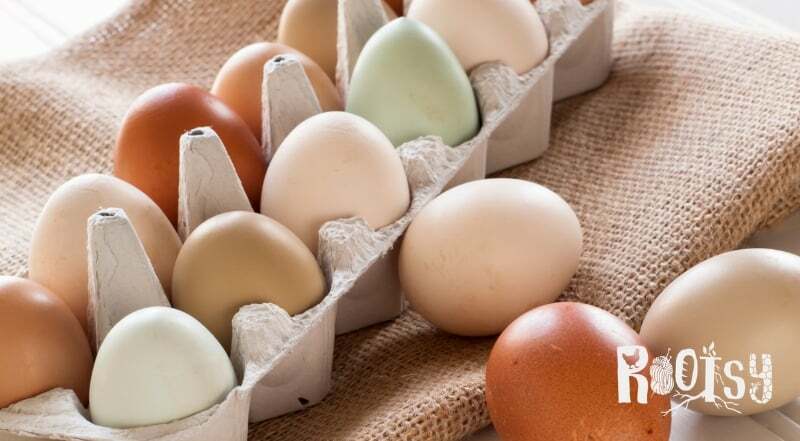 Selling eggs – Selling eggs for eating is probably the most common way of making money from the homestead. However, it’s not very profitable. A better option than selling eggs for eating is to sell fertile eggs for hatching. Of course, you need a rooster and good genetics. You’ll make more money if you specialize in hard to find breeds. Breed animals for sale or sell stud services – Some people don’t want to deal with breeding or will bucks, bulls, or stallions, but they want mamas and babies. If you have animals with good genetics, people will pay you for their services. Raising bees and selling the honey and wax – Honey and beeswax are very profitable endeavors for the small homestead. You can even take it a step further and sell value added items turning the wax into usable goods for others – such as body care items, furniture polish, and other goods. Selling goat or cow milk (check regulations for your area) – If you have a dairy goat or cow you can sell the excess milk. Or like the beeswax, make value added items such as cheese or soaps with the milk. You’ll get a higher price without much more work by selling it in a different form than raw milk. Selling home canned goods (check regulations for your area) – While people might only pay 50 cents for a cucumber they will gladly pay 10 times that for a jar of homemade bread and butter pickles. Unlike fresh produce, home canned goods can be sold year round which helps stabilize the income from your homestead. Selling home-baked goods (check regulations for your area) – Use your garden produce to make and sell home baked goods. These should be packaged nicely and labeled properly according to your local regulations. If you’re selling at a farmers or craft market consider packaging your items in small amounts that can be consumed while they’re walking around – this is especially true of sweets. Selling soaps, salves, tinctures – Use the herbs you grow or forage to make soaps, salves, tinctures, etc. These items are not hard to make and will net you more profit than selling the dried hers. If you’re interested in making soaps and other body care items The Nerdy Farm Wife has a free mini-course to get you started. If you’ve already made soap but want to go deeper in your craft, she also has a full soap making course. Crafting – Sell pottery, crochet, knitted, and sewn items that are sought after. This would include items for the home that are easy to make but are fashionable and popular. Handcrafted cards and recipe cards are also great money makers, especially if you can make them into digital downloads. Make and sell bags – Bags are all the rage and simple to make. If you are a hide tanner make leather bags from the hides you tan. If not, canvas is a wonderful, all purpose fabric for bags. Woodworking – Woodworking comes in all shapes and sizes. If you have a lathe you can create rolling pins and bowls. If you like to build things, make milking stand, coops, and hutches. If you like to paint, create signs and yard art out of wood. Pallet wood is very popular and, usually, free which makes it a great source of wood for your crafts. Sell firewood – If you have access to a lot wood consider selling firewood. It will need to be cured properly and you’ll need to manage your land well so it’s a renewable resource for you, but selling firewood can be a money maker if done properly. Farmsitting – It’s hard for farmers and homesteaders to travel, especially if they have a lot of animals. Taking care of another farmer’s animals so they can travel is a great way to make money and deepen your local homesteading community. Tours, mazes, and venues – If you enjoy sharing your homestead or farm with others you can make quite an income from giving tours or teaching classes on your property. Pick your own farms, corn mazes, and pumpkin patches are another way to make money from your land. If you have enough land, you might consider creating a venue for weddings, parties, or family reunions. Create a website – There are many ways to earn an income from a website. You can sell courses or physical products. You can generate affiliate income or income from ads on the site. The possibilities are endless. Write books – Digital books have opened a huge field for those who want to share their knowledge but don’t want to publish with a traditional publisher. Virtual Assistant and other remote work – The internet has changed how people work. No longer does an assistant have to work in the same office as the boss, in fact, they don’t ever have to meet in real life. Virtual assistants can do many things or just one (social media management), you get to choose. Other remote work might be bookkeeping, data entry, video creation, or even voice overs for others. It is definitely important to do your due diligence and research the local laws, guidelines, and requirements for your area for raising animals and selling by-products. Start with your county offices and they should be able to give you information or point you in the right direction. If you sell edible products the regulations are going to be stricter than if you don’t. It’s important to know and follow the regulations as the fines for breaking them can be quite steep. There are SO many ways to make an income. For us, it meant coming together as a family and being resourceful. We could have easily taken a job in the local towns, but that was not how we wanted to roll. Our freedom and the comforts of our home are so strong and important to us, and that is where we wanted to focus our efforts. For more ideas to make money on the homestead try these posts: Growing Mushrooms for Profit and The Reality of Selling Eggs from Farmstead Chickens. What is important to you? What are your goals for your homestead? What ways have you earned an income from your homestead?